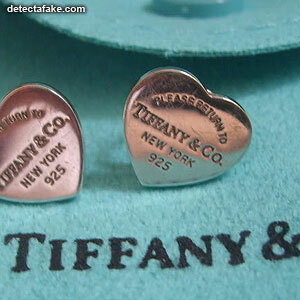 Tiffany & Company was founded in 1837 by Charles Lewis Tiffany and John B. Young in New York City. They originally started as a "stationery and fancy goods emporium" in Lower Manhattan. Since then they have become known for high quality goods, including jewelry. 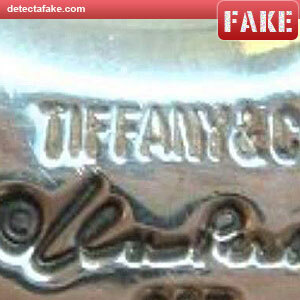 Along with their success, many counterfeit goods have entered the market with the "Tiffany & Co." name. 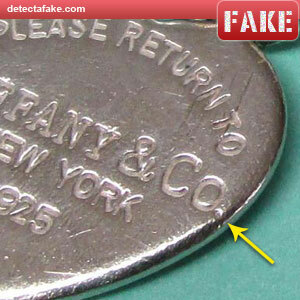 Below are a few steps to help identify fake Tiffany & Co. jewelry. First, check for overall quality, alignment issues and misspelling. If you see any of those issues, it's probably fake. Next, if it has a chain, look at the links. 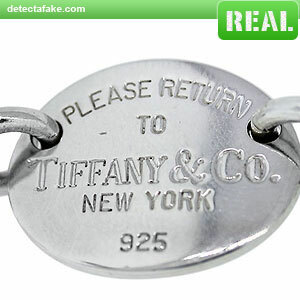 Authentic Tiffany links will be soldered so the break in the link can not be seen. 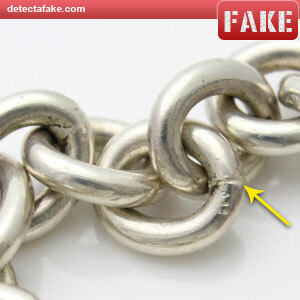 If the piece you're looking at has no solder at all, or you can see where the link was soldered, assume it's fake. Next, look at the stamping. All stamping should be centered and not too close to the edge, like the fake one above. 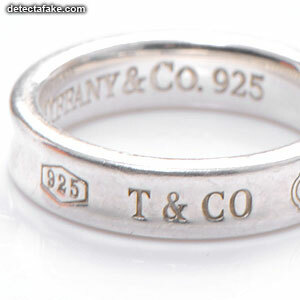 Next, if the item is silver, it should be stamped "925" or "Sterling". If you don't see either of them, it's fake. If you do see it, make sure it is aligned properly. 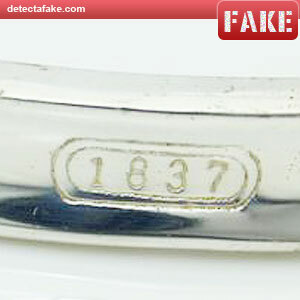 Notice on the fake above, the "925" does not follow the contour of the jewelry. Next, if it is used, look for wear. 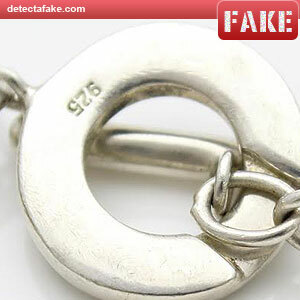 If the item is authentic, it will be made of solid silver and will not show any other color below when wear occurs. 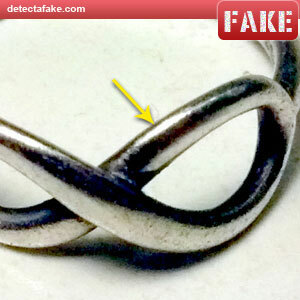 If the item is fake, most are made of some other metal and then silver plated on the outer surface. 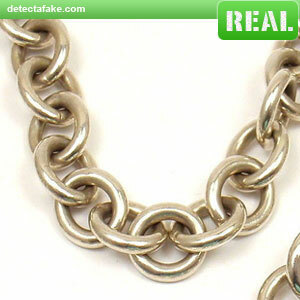 When a silver plated item gets worn, it will show a different color metal in some areas on the piece. If you do see areas that are showing a different color below, it's fake. Next, check the stamps for font and alignment. Notice the "1837" on the real one above. It has wide numbers, they are all aligned with each other and they are all straight vertically. The fake above has thin numbers and the "7" is angling to the right. Another difference is the "8". The real one overlaps itself in the middle. The fake looks very different. 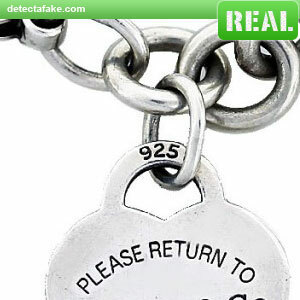 Another thing to look for is the "PLEASE RETURN TO" stamp. 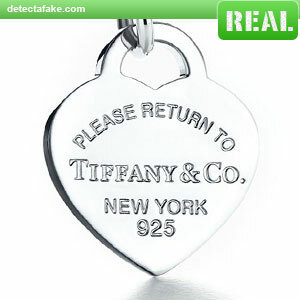 Many of the fakes fail to put a space between the words, so it reads: "PLEASERETURNTO". Next, make sure all stamps can be read clearly. The fake above fades away on most of the bottom. If you see any of the stamps that are hard to read, it's going to be fake. Next, look at the "Tiffany" font. Look at every letter and make sure it looks like the real one above. The fake one does not look like the authentic on any of the letters. To link to this page from your website, simply click inside the box, then copy and then paste the code to your web page. 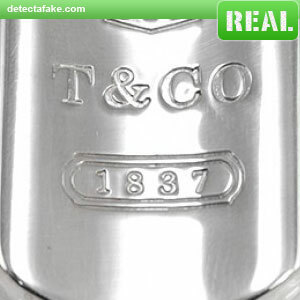 You can make a difference in the fight against counterfeit goods by sharing any pages on this site that you find helpful! 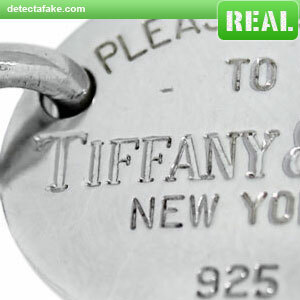 © 2014 Detect-a-Fake. All Rights Reserved.